A National Flag for Canada was discussed in detail dating back to 1895/96 by heraldry enthusiast Edward M. Chadwick and others. It was suggested again in 1919 after the First World War with input from expert individuals such as Major-General (later Sir) Eugene Fiset. In 1925 our Canadian Government requested formal submissions and designs from all Canadians, but failed to make any final decision. Then again in 1946 our Government addressed the National Flag issue with requests for more public input through design submissions and advice from experts. In 1956 Lester B. Pearson (Minister of External Affairs) was successful in brokering a deal to end the Suez Canal crisis (of which he won the Nobel Peace Prize). During this work Mr. Pearson offered Canadian soldiers as peace keepers. His offer was rejected based on the simple fact that our soldiers wore a Red Ensign on their shoulder and could be mistaken as British soldiers. Mr. Pearson was so disappointed by this decision he made a promise to himself to work toward the creation of a National Flag for Canada. In 1957 Mr. Pearson became the leader of the Liberal Party of Canada. In 1960 the Liberal Party of Canada instituted a party policy to create a National Flag for Canada. In 1961 John Ross Matheson from Brockville Ontario was elected in a by-election and became the Liberal Member of Parliament for Leeds County (now Leeds & Grenville). 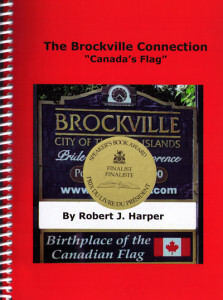 Mr Matheson had been involved with the study of heraldry, flags, ensigns, colours and coats of arms since 1949 with his good friend George Beley (co-founder of the Heraldry Society of Canada, now the Royal Heraldry Society of Canada) in Brockville Ontario. 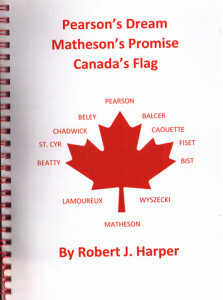 Mr. Matheson met with Mr. Pearson on Parliament Hill in July 1961, it was at this meeting Mr. Pearson explained his dream of a National Flag for Canada and asked his newly elected “Flag Expert” to begin working behind the scenes on what it would take to bring a National Flag of Canada to fruition. Mr. Matheson promised to complete the work. From late 1961 through 1963 Mr. Matheson sought out and enlisted the expert advice of historians, heraldry experts, and any previously documented informaton available to him.